4. the "Five Grains motif". The Money Tree is a universal motif of a great "world tree" ascending from earth to heaven and found in the paradise gardens of the heaven. This form of heavenly tree is laden with beautiful blossoms and unending money motifs, radiating divine light and appear to be as brilliant as precious jewels. 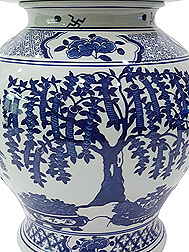 The Wish Fulfilling Tree is the most fundamental divine pillar of wealth in feng shui. It implies financial strength and not just money earned randomly. Earning/winning money randomly does not imply financial strength. Financial strength enables one to be able to retire luxuriously and resist any forms of instability in the long term. The tree generates financial success, enable you to earn higher incomes and build greater fortunes. It showers you with money, bountiful amounts of money, multiplying, duplicating, replenishing itself, infinite money, recreating money effortlessly where money rush to you. It opens up endless possibilities, superlative success, overflowing abundance and initiate the journey to riches. Infinite money awaits you each day and endless opportunities and blessings will come your way. Money accelerates to you explosively and rapidly. 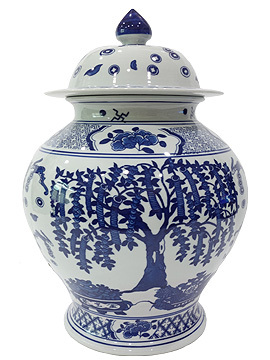 Rice urn that is made from porcelain is auspicious because porcelain represents earth element, and it is important to energize rice with earth energy. It is advisable NOT to keep rice in plastic or wood containers. Note: This item comes with a free "Three Gold Dynasty Thick Coins" tied in red thread. The rice urn can store up to about ~5kg rice. 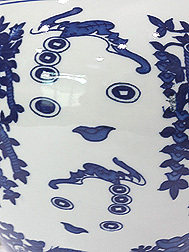 It can also be used to make an Extra-Large Wealth Vase for those who are truely ambitious. 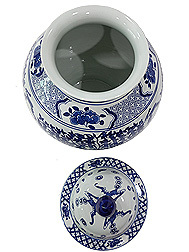 What the rice urn symbolizes and how to place this object? 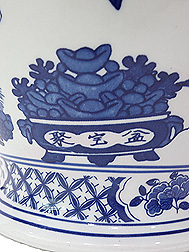 The rice urn is the stomach of a family and it represents income, savings, business and wealth abundance. It is important as a minimum requirement for anyone who want to get seriously rich. Luck in abundance leads to fullness in food supply, good harvest, flourishing income, riches and happiness to the family. Please do not keep your rice in plastic bags, dustbin style containers, plastic containers or wood containers as they are inauspicious. 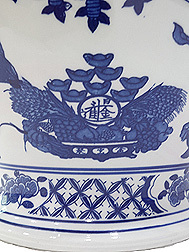 It is best made from porcelain and the best of all shapes is of course in the form of a wealth vase where the neck is small and the stomach is wide followed by a slim base. This connotes financial stability and the ability to save. The total size must be substantially large and heavy to signify that you have more than enough to eat. The rice urn must always be filled to two third of its interior at all times. Place a red envelope with 3 Gold Generation Coins or 9 Emperor Coins inside the rice urn together with rice. The rice urn is best placed on the ground level to absorb earth energy. It can either be placed openly or enclosed in the kitchen cabinet as long as it is placed in a safe zone (away from running kids or pets). It must always be handled with care. Remember that it is fragile!